The quick thinking, ingenious Roosters are a pragmatic lot who prefer not to take any risks. Roosters are so aware of what’s going on around them that some may believe them to be psychic. 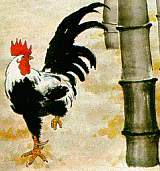 It is not easy to sneak anything by a Rooster. These beings are a frank, honest lot who do not pull any punches and admire those who are truthful with them.